We are always looking to partner with communities that have a comprehensive plan for what they envision for their historic downtowns and neighborhoods. We typically look to rehabilitate or build properties that offer the possibility to create new housing opportunities and commercial space. The ideal project is mixed-use, having 30-60 residential units with ground floor commercial space. However, we also have some interest in creating single-family housing (attached or detached). Property Tax Incentives such as TIF, Abatements, etc. If your community has a historic building or vacant lot that meets our ideal project size and that you would like us to consider to development, please download, complete and submit the form below. 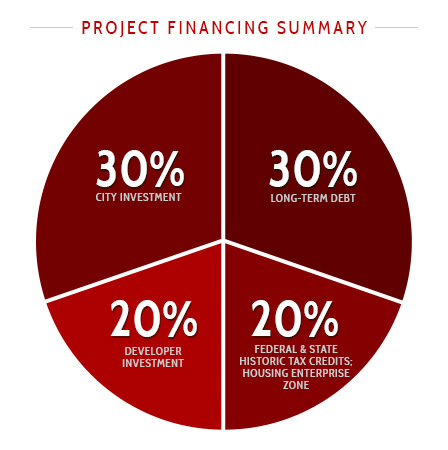 This chart shows a typical breakdown of the sources of financing. The availability of local, state and federal incentives may change the proportions of each funding source.